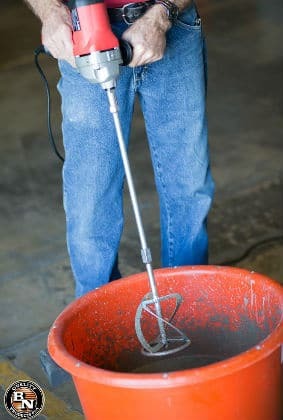 Concrete construction professionals understand that within any concrete job, it is imperative to follow necessary guidelines as they apply to mixing concrete. When concrete is created without consideration of concrete properties, possible chemical occurrences and proper mixing procedures, the result could be concrete that isn’t strong enough, that breaks easily, that doesn’t last or that doesn’t solidify at all. Generally, bagged concrete has directions that make the at-home concrete process easy, but when it comes to professional jobs, there is a system professionals must follow and a system professionals must avoid. While most concrete professionals are aware of basic concrete mixing techniques, it’s imperative to understand the basic concerns of the process and what types of problems could arise if certain standards are not met. Every concrete job is unique. The different factors that come into play are size, color, finish, depth, shape, usage and weight distribution (think large-scale concrete projects such as parking garages or second, third, fourth stories, etc.). Concrete professionals need also to understand the different specifications of residential and commercial projects. Most residential projects in colder climates, for example, require a minimum cement content of concrete around 470 lbs. per yard. If the concrete is going to be stamped, the aggregate needs to be the right size, as well. The owner or project manager of the structure being built will have certain specifications regarding all of these factors. Budget comes into play, as well. Once each specification is considered, the following steps include layout, prep and placement. Remember to also take in account whether or not the layout will require control joints, as do most sidewalks and pathways. Concrete needs to have the right ratio of water to cement. If there is too much water, the resulting concrete will be weak or susceptible to cracking. When concrete is placed and it’s too wet, cracking can result. When concrete is mixed with too little water, shrinkage cracking can occur as remaining water evaporates. Other factors that lead to shrinkage cracking include mixing concrete with not enough paste or cement, or a lack of control joints. Cracking that occurs from sudden changes in heat or cold after concrete placement can be avoided by covering or enclosing the project. Cracking that occurs from structural movement generally happens when the rest of the structure is built without following initial guidelines. Creating solid guidelines regarding each detail of the project can help avoid this type of damage. The most important factor with mixing concrete is making sure the resulting mix has strength and durability. This is where mixing things properly comes in. Each concrete mix has to have to right amount of water vs. pounds of cement. Strength can be measured by making test chunks of concrete, curing and then crushing. Most strengths range from 2,500 psi to 4,500 psi – but always take into consideration whether or not the surface will freeze, and at what temperatures. So how is the water to cement ratio calculated? Divide water of one cubic yard of the mix by the cement in the mix (all in pounds). If the water is in gallons, multiply by 8.33 to find out how many pounds exist within the mixture. 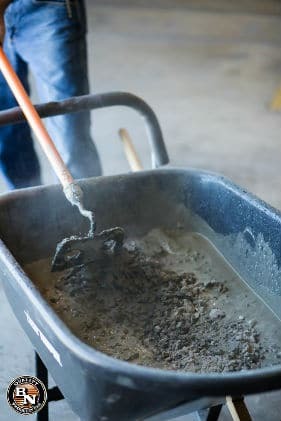 Remember these two tips when mixing concrete: there will be more durability within the mixture when the concrete mixture is less permeable. There will be more strength within the mix when there is a lower water to cement ratio. You may have determined the right amount of water to concrete and you may have figured out the correct size of aggregate to place in your mixture. When each factor that affects concrete integrity is considered and met, there is still something else to think about. A solid concrete mixer can help to avoid any disasters with the consistency of the concrete you need. Concrete mixers can help you avoid inconsistent water/cement ratios, impurities, and inadequate aggregate gradation – all of which can lead to weak concrete. But what types of concrete mixers do the best for each job? As stated above, each job is different, so it’s best to have on hand different types of concrete mixers, right? Not necessarily. When concrete professionals seek out the best tools for the job, they take into consideration reliability, function and ease of transport. Since many concrete mixers are massive and cannot be transported easily, it might be a good idea to invest in a mixer that will still do the job reliably even though it is smaller and generally easier to transport. Many times the area in which the project takes place is small (think basements, attics, apartments, the side of the house, etc.). You don’t want to invest in a concrete mixer that cannot fit within the area. However, if a paddle mixer is easy to transport, most likely, it will fit into whatever space you’re working easily and conveniently. A reliable, easily transportable concrete mixer will help do the job right. This is, of course, the most important aspect to think about when investing in a mixer. Since the consistency of the mix is what drives the overall integrity of the concrete surface, this is the last thing on which a concrete professional should ever compromise. A mixer can help create this consistency even when other factors might be unreliable, such as weather or structural elements. Look for one that is flexible, that lasts, that has replaceable paddles and that will prove to do the job right every time.